Where is the best placement for a radiant barrier? Radiant barrier, cellulose, home, energy, fiberglass, radiant barrier, attic insulation, energy conservation, green building, Home Depot, Arizona Public Service, APS, Salt River Project, SRP, new APS rates, Solar panels Phoenix, Lowe's. How much is attic insulation? Where Should Radiant Barrier Be Installed? Fact: Radiant barriers are not rated using the R factor. Radiant barriers are measured by reflectivity and emissivity. Fact: Radiant barrier was not invented by NASA, it was invented by Sir James Dewar, a Scottish physicist who invented the Thermos Bottle among other things. Fact: Lowering the emissivity of a surface (which is one aspect of a radiant barrier), can have negative consequences, as in making your home use more power and become more uncomfortable if installed incorrectly. Reality: Radiant heat is not just from the sun, radiant heat is everywhere and is the fastest way heat enters your home during the summer and contributes to large losses during the winter. Many radiant barrier systems (RBS), are designed to be placed at the roof to either reflect radiant heat or lower the emissivity from bare wood at .95 to something lower. However, this only true on attics with a pitched roof and a ceiling. This does not apply to sheds or open buildings. And the steeper the roof (like homes in Houston TX), the more convection and greater the negative effect. The inverse is true on a flat roof it's not an issue because there is no convection. Lowering the emissivity of a roof decking the attic with silver paint, laminated foil up under the roof decking raises the temperature of the surface above it, that's just basic physics and common sense. If radiant heat is restricted from emitting from a surface (as in the bottom of your roof decking, a chrome car bumper or a chrome socket in your toolbox), heated by the sun, where does this heat go? With lower emissivity it's going to increase the surface temperature and have to radiate back out...one problem: the sun is beating on it at the same time. Is that going make your roof hotter? Of course it is. Is this going to extend the life of your roofing system? (shingles or on tile roofs, the underlayment?). I'm not going to leave myself open telling you my experiences so let me tell you what the largest shingle manufacturer told me during a recent phone call: (question) "Yes, I have a question. Will installing a radiant barrier under the roof affect the warranty of your product?" (answer) "Our 25 year warranty covers manufacturers defects". When pressed for an answer regarding the installation of a radiant barrier and elevated roof temperatures I was again told: "Our warranty only covers manufacturers defects, that's all I'm going to say, good bye". It seems I'm not the only one afraid to touch on this topic so that leaves the reader on his/her own to decide if increasing the roof temperature is going to lessen the life of the roofing system by making it hotter and drying it out. This really becomes a problem with concrete tile roofs that rely on a thin piece of bitumen based (tar), felt (paper), to keep the ceiling dry. When this dries out and curls up, all the tile has to come off, all the wood strips, all the underlayment, and be replaced. Homes around here are having to have it done at the tune of $8,000 to $12,000 which is mostly labor. Think twice before spraying paint under your roof, buying foil backed OSB or stapling a reflective membrane up under the roof deck. The last thing you want to do is make your roofing material hotter. If increasing the roof deck temperature when lowering the emissivity under the roof increases roof temperature, how is this going to affect the air in the attic that is in direct contact with this hotter roof? Stands to reason if the roof deck is hotter, the attic air is going to get hotter from the increased convective air movement from the hotter roof deck. If the air in the attic is getting hotter via convection from the hotter roof, wont this in turn make the insulation hotter and the ducting in the attic hotter? Hotter than a house without RBS on the bottom of roof deck? Basic physics and the laws of thermodynamics guarantees it will and the graph below illustrates it. Next question: If the attic insulation gets hotter than an attic with bare wood, what happens when the sun goes down, and the roof cools off? What is this superheated insulation now facing? A reflective radiant barrier. A radiant barrier which now effectively holds the heat in the attic for hours after the sun goes down. (again, see the graph below). We would rather see the RBS right above the insulation, keeping heat out during the summer and heat in during the winter. This also does not affect roof temperature as the emissivity of the roof has stayed the same. 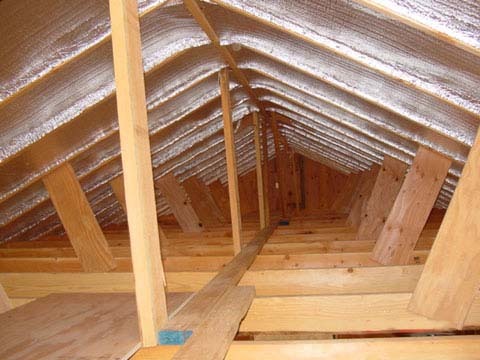 The reason radiant barrier is stapled up against the roof is because of eventual losses due the accumulation of dust which virtually negates the performance it once had. Covering the ducting in the attic with RBS is also another significant energy conservation method. Click here to see our duct wrap page. Fact: Dust is a major problem with RBS rolled out over the attic insulation. This is why our Thermal Control Membrane has multiple layers to deal with this problem. It's also proven, patented and once installed, will change the way your home feels forever. TCM is the only radiant barrier with a lifetime performance warranty. Before buying any radiant barrier or reflective insulation product ask about a performance warranty. More facts: Insulation has a tremendous potential for storing heat. 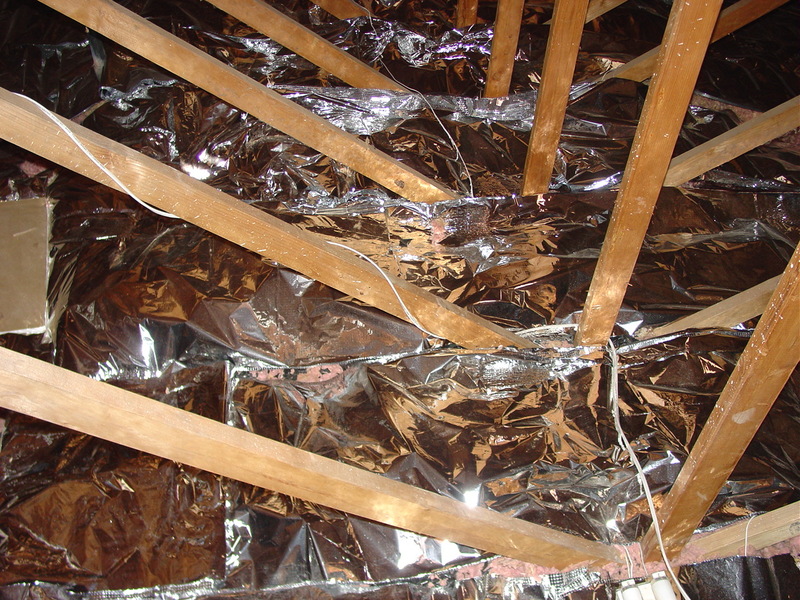 Insulation resists heat loss (R factor). Here's a good question: If you are outside in January at night, would you put a sweater on? Question #2: Do you wear sweaters in August when you working out in the yard? In the sun??? And your home has walls and ceilings packed with sweaters? To keep the heat out???? We have developed innovative, proven methods that far exceed the performance of conventional insulation products. Read on and become enlightened and once aware of what the alternatives are, you can make better decisions on obtaining comfort for less cost. Before you spend your energy conservation dollars on anything, especially a radiant barrier product, do some research, follow the logical path and ask a lot of questions. Specifically, ask for a lifetime performance warranty and compare samples. If you are still skeptical, give us a call and we will put a four foot square piece of TCM above your ceiling and come back the next day late afternoon and show you in real time how effective it is using an infrared camera. Click here to schedule that. In the summer of 1993 an Arizona electric utility began testing the performance of three types of Radiant Barrier Systems (RBS) in three different placements in four identical unoccupied homes. One home was a control house with no RBS. Data collection included time, temperature and measurement of power usage. All power was shut off in these homes except for the heat pump. The results of this testing brought to light some interesting data as shown below. Our product, RBS Chips, is outlined in green. RBS Chips was our first patent on reflective insulation which led to the creation of Thermal Control Membrane. Had the house with the green line been Thermal Control Membrane the green line would be significantly lower all day. went on for 12 months. Placing a radiant barrier directly under the roof decking as illustrated above raises the attic temperature (and energy consumption), between 2pm and 8pm. The reason is simple, when the inside roof deck surface emissivity is lowered from .95 (bare wood), to a lower value the result is a hotter substrate hence the logic behind the radiant barrier. This is a perfect application for a flat or nearly flat roof deck. The reason being, the increased temperature of the roof deck will not create convective movement since the roof is not pitched. The steeper the roof, the more convection there will be which in turn heats up the attic insulation and once the sun goes down, the elevated attic insulation is now facing the radiant barrier on the bottom of the roof. Again, this only applies to pitched roofs. Spraying a roof silver underneath the roof deck or using a plywood decking product with a radiant barrier laminated to it is an improper installation, especially if the attic is vented to standard venting code. Roll our proven Thermal Control Membrane over your existing insulation. Radiant barrier stapled up against the roof will increase your roof deck temperature, accelerate the degradation of your tile underlayment membrane and/or shingles and has no effect on cold winter nights. TCM applied in a hot climate on an exterior wall which will be re-stuccoed. In cold climates, install on the inside just behind the sheet rock and tape the seams. Click here for more information on this exciting new sustainable building product. Building a new home? Adding a room? Drop us email at pleasesavenrg@gmail.com anytime if you have questions about how to make your new home or addition super energy efficient and comfortable. Thermos Bottle...keeps heat out in the summer and heat in during the winter. Visit our online store! You can have these and other innovative energy products shipped UPS to your front door! Free shipping!